The annual WATER PROFESSIONALS CONFERENCE (the joint meeting of the KY-TN AWWA and WEA) was held at the Northern Kentucky Convention Center, in Covington, Kentucky, July 26-29. Our Ice Cream Social was a great success and we enjoyed visiting with all the participants. We are pleased to announce that we have added Trenton Light and Water to our list of valuable clients. Cleveland Utilities was recently named as the recipient of the American Public Power Association’s prestigious Community Service Award in recognition of its workforce’s involvement in civic initiatives. The award acknowledges activities that demonstrate the commitment of a utility and its employees to the community. Work on a Sewer Master Plan is underway. The Automatic Read Water Meter System Phase 1 project is complete and specifications for the Automatic Read Water Meter Installation Phase 2 have been approved by the State. This project bids November 19. The Capacity Assessment Plan, Sewer System Evaluation Survey Work Plan, Fats, Oils and Grease Control Program, and Sanitary Sewer Overflow Response Plan are complete and approved by EPA as part of the Administrative Order of Consent. The Pump Station Operations and Preventive Maintenance Program, Gravity Line Preventive Maintenance Program, Continuing Sewer System Assessment Program, Infrastructure Rehabilitation Program, and Information Management System are complete and have been submitted to EPA for approval. Design for the Carters Creek Pumping Station is 90% complete and plans and specifications are being reviewed. Design is complete for the Holiday Drive and Lantana Estates WaterLine Replacement Project, which consists of the replacement of 19,000 L.F. of 6-inch asbestos cement water line. Plans and specifications have been approved by the State and a Pre-bid meeting has been set for January 7, 2016 and a Bid Opening date of January 19, 2016. A Community Development Block Grant was awarded for Sewer System Rehabilitation in the amount of $449,596. Construction on the 6.0 MGD Membrane Water Treatment Plant is complete and the Plant is in operation. 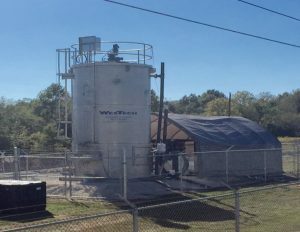 An engineering report for improvements to the WWTP is complete and has been submitted to the State. 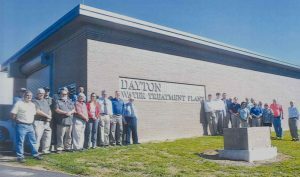 A contract for 26,000 L.F. of 4 and 6-inch water line has been approved between TDEC and Dayton. Funding for this project was awarded with the Abandoned Land Mine Fund in the amount of $363,000. Work on the Hwy 27 North White Oak Road sewer lines has begun with Norris Brothers Excavating being the Contractor. Currently, the Contractor is boring and laying sewer line. An agreement has been executed for engineering work to be performed for a new 200,000 gallon elevated water storage tank at Clarkrange. The Highway 127/62 utility relocation project through TDEC has a letting date of March 2017. The $10,268,077 North Wastewater Treatment Plant Expansion Project will expand the peak flow capacity from 15.0 MGD to 25.5 MGD. The Clarifier equipment has been set and work in the central pump station is progressing. Final plans and specifications for renovation of the aerobic sludge digesters at the North Wastewater Treatment Plant are complete and have been submitted to KDOW. This project includes replacement of the existing sludge transfer pumps, building electrical system, and HVAC system. Construction of the South WWTP Sludge Building is underway with the foundation steel in place and concrete to soon be poured. This contract was awarded to Deig Bros. in the amount of $90,747. Painting and renovation of the 500,000 gallon Frontier Water Storage Tank, awarded to Tank Pro, Inc. of Northport, Alabama with the low bid being $491,667, is making progress with the Contractor currently painting the interior. Design of the South Water Treatment Plant renovation, which includes a new 4.0 MGD GE Water and Process Technologies Membrane Filtration System, Solids Contact Clarifier and GAC Contactors Pilot Testing, is underway and the first design coordination meeting with GE has been conducted. 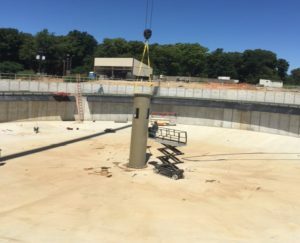 Plans and specifications for several other projects at the South Water Treatment Plant including design of a new 24-inch raw water line, 800,000 gallon prestressed concrete clearwell, and painting of the conical clarifiers have been completed. It is anticipated that these projects will bid as funds allow. A design kick-off meeting for improvements to the collection system in the Atkinson Park drainage basin was conducted and design is underway for the replacement of two sewage pumping stations, 9,000 L.F. of 12-inch through 18-inch force main and 1,500 L.F. of 12-inch gravity sewer. We have been selected to provide engineering services for two new projects in Henderson. Plans and specifications for the renovation of the 1.0 MG Vine Street Water Storage Tank and a preliminary report for improvements to Graham Hill Tank Area of the North Water Distribution System are underway. Work for the $525,000 CDBG Sewer Rehab project is progressing with Dynamic Construction of Gordonsville, Tennessee being the Contractor. Currently, 1,467 of 5,365 L.F. of clay and concrete gravity sewer by pipe have been replaced using bursting methods. In addition, 15 of the 36 Manholes have been installed. Completion is expected in December 2015. Contracts for the ARC/SRF project for Lewis County and Hohenwald that extends a 6-inch water line approximately 28,000 L.F. along Summertown Hwy, have been approved by ARC and await SRF approval. Plans and specifications are complete and ready to be submitted to appropriate agencies after the environmental review is complete. Construction on Phase II Priority No. 2 Sewer Rehabilitation Project is complete with the exception of punch list items. Cumberland Pipeline was awarded the contract for the U.S. Highway 41A water line project, which consists of approximately 15,300 L.F. of 16-inch water line to increase flow and pressure at the Interstate 24 interchange, in the amount of $1,659,958. Contractor has currently laid 2,393 of 15,082 L. F. A completion date is scheduled for April 2016. Final approval from KDOW for the Regional Facility Plan for the Hammond Wood Wastewater Treatment Plant was received. We are currently assisting the Owner with on-going water system modeling. A Community Development Block Grant was awarded for sewer system improvements in the amount of $525,000. The High Service Pump Replacement project, awarded to BAM 2, is scheduled to be completed January 2016. Design of several improvements at the Miller Avenue Wastewater Treatment Plant has begun. Surveying is complete and design is underway. Design work on the Cornersville WWTP Sludge Holding Tank is underway and construction document production is in process. Design of chemical feed and storage facilities at the Lewisburg WWTP is underway. Work for the Water Production Upgrades and Electrical Renovations project is complete. A WWTP Nutrient Optimization Plan was submitted to TDEC, late this summer, which resulted in a revised NPDES Permit. Further monitoring will be performed to confirm optimized plant operation. J&M Grading Division, LLC was the low bidder for the TDOT SR 52 Utility Relocation project. A pre-construction meeting is pending. Design is underway for approximately 3,500 L.F. of sanitary sewer line replacement in the Madison Square area. Water Quality Modeling work is underway to determine the impacts of a reconfigured effluent discharge concept. The intensive field sampling is wrapping up and modeling will begin soon. The design of 15,876 L.F. of the 16-inch North Transmission Line was submitted to KY DOW and approved contingent upon environmental approval. A Beneficial Reuse of Special Waste Permit Application was submitted to KDOW on behalf of the Owner. Construction of the Wallace Park Sewer Separation project is complete with the Contractor working on punch list items. Construction on Cook Street Sewer Basin Storage Facilities is underway with an expected completion date of January 2016. A final report for the Harrison Street CSO Elimination has been submitted to the Owner. A Sewer Master Plan study has been submitted to the Owner. This will provide the City with an orderly map to assist with the development of the sanitary sewer collection system. 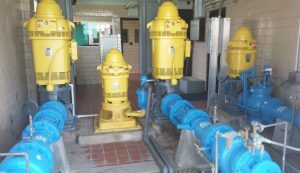 Design for Johnson Controls Pumping Station and Sludge Pump Replacement is complete and has been submitted to the Owner. This project bids November 24. Phase I of the TDOT State Route 128 road widening is under construction. This project includes relocation of water, sewer, and natural gas utilities. Construction on the WTP Gravity Filter Renovation, with Ronald Franks being the low bidder at $98,837, is underway. Tanks have been delivered and are installed. A Community Development Block Grant was awarded for water system improvements in the amount of $400,440. Design is underway for approximately 2,000 L.F. of sanitary sewer line rehabilitation. Design is complete and plans and specifications have been approved by TDEC for the renovation of the 2.16 MGD SBR Wastewater Treatment Plant, which recently received a Community Development Block Grant in the amount of $525,000. Route 1 for the Water Meter Replacement project is complete. Utility line relocation plans for the I-69, Phase II & III as well as State Route 5 have been completed and are awaiting TDOT’s letting. Work on the Water Treatment Plant Clearwell is nearing completion with backfilling, grading, seeding, and sowing remaining. Completion of the WWTP Digester Renovation project is nearing with close out paperwork remaining. The W. Reelfoot Avenue Water and Sewer extension is complete with the exception of paving. TDEC approval on the sewer pumping station of the Industrial Park North Water and Sewer Improvements Project was received. Design work to replace an 8-inch waterline on Martin Luther King Drive is underway.